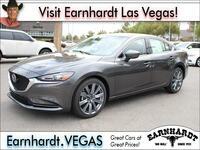 Are you drawn to the sleek lines and athletic attitude of the Mazda6 midsize sedan? You are in for a treat. With the debut of the re-engineered 2018 Mazda6, the flagship Mazda sedan is more powerful, more luxurious, more advanced and more attractive than ever. 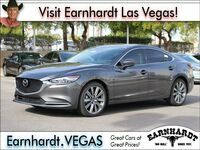 Learn more about how the Mazda6 ups the ante at Earnhardt Mazda Las Vegas with this in-depth 2018 Mazda6 vs 2017 Mazda6 comparison. A world-class edition in the midsize sedan class, the Mazda6 provides the perfect combination of athleticism, efficiency and style that many families search for. Innovative SKYACTIV® TECHNOLOGY inundates the Mazda6 platform, from the chassis and body design to the engine and transmission, delivering unrivaled athleticism for the driver who wants to add pizzazz to their daily commute. What Are the Differences Between the 2018 Mazda6 and the 2017 Mazda6? 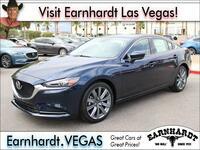 When the 2018 Mazda6 arrives at Earnhardt Mazda Las Vegas in the spring, it promises to be an upgrade on the already popular 2017 Mazda6. As more and more new variants arrive at dealerships, many car shoppers will want to know – what's the difference? 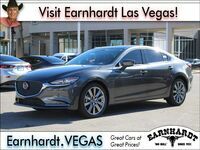 Armed with this 2018 Mazda6 vs 2017 Mazda6 comparison, drivers can find the model that is the best fit for their lifestyle and budget. Upgrades to the Mazda6 design start under the hood with a refined 2.5-liter SKYACTIV®-G four-cylinder engine and the addition of a turbocharged SKYACTIV®-G 2.5T four-cylinder powertrain option. New 2018 Mazda6 models will employ a refined variant of the tried and true 2.5-liter SKYACTIV®-G engine that uses cylinder deactivation at constant speeds to maximize fuel economy. Paired with the six-speed SKYACTIV®-Drive automatic transmission, the Mazda6 promises an efficient and fun-to-drive performance. An update to the 2018 Mazda6 design that performance enthusiasts will come to love is the addition of an optional powertrain. With the available turbocharged SKYACTIV®-G 2.5T engine under the hood, you will enjoy 250 horsepower and 310 pound-feet of torque that is made even more exciting by standard G-Vectoring Control technology for all models. Married to a six-speed SKYACTIV®-Drive automatic gearbox, the turbocharged Mazda6 will deliver unrivaled thrills at every turn. When you get behind the wheel of the 2018 Mazda6, you will notice a wealth of changes that promise to improve your day-to-day drive. Additional cabin insulation helps eliminate road noise and a dynamic dashboard design adds to the interior style of the Mazda6. Drivers who opt for the all-new Signature trim will enjoy peerless luxury at a great price with Sen wood accents, Nappa leather interior and UltraSuede® Nu trim that are complemented by a wealth innovative technology features that include an eight-inch MAZDA CONNECT™ touchscreen interface and advanced safety systems.